Its 2005 and Jim Marsden is looking to improve his edge on the ultra competitive UK Winch challenge scene. Having spent years playing with larger, more expensive single motor options it was clear that something else was required... The very first Gigglepin Twinmotor conversion used an existing Warn 8274 top housing that was modified to accept two motors. This worked very well, but after only a few events problems arose. The standard Warn gears were simply not man enough for the job and a rethink was required. Jim and the team set to designing new Twinmotor Top housings, and only a few weeks later the NEW design was finished and the first batch were dispatched to their very happy new owners. The Legendary Gigglepin Twinmotor Top housing. Changed offroading forever.. 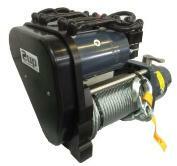 The Twinmotor top housing fits all Warn 8274, Warn 8074 and All Gigglepin 80series winches. It is easy to fit and comes supplied with everything you need to complete the task. Taking less than an hour to fit it is one of the fastest yet most productive up grades you can add to your vehicle. This new twin motor top housing was launched in 2012 and offers a tough, rugged conversion for those who need the best, but do not require multiple ratio choices. Launched at the Peterborough Landrover show in September 2012, this top housing suits many new users in the Clubman and Expedition scene. The Adventure series has the extra motor positioned to the front of the winch making it easier to fit to vehicles such as Landrover Defender TD5 where space is limited. Using the same quality gears and LM heat-treated castings, it is superb value for money and is already a big seller in Europe and sure to become a legend in its own right. This superb adaptor is designed to convert most models of lowline winch to twin motor, without altering the mounting pattern of your winch! A simple bolt on fitment, this adaptor is precision constructed from billet aluminium, and features a simple belt drive system to keep energy loss to a minimum. With fitment for Goodwinch Goldfish TDS winches, Superwinch EP9/Talon, Runva/Warrior winches and many Warn models, this is a simple cost effective way to get yourself a twin motor winch!